This was the longest day of the drive for us. We had to start from Pune and reach Mount Abu. We had to drive through Gujarat and enter Rajasthan. 6:20 AM We left the hotel. The hotel is right on Pune Mumbai bypass and entry into expressway is pretty easy. 6:40 AM We reached the toll gate for the expressway. The expressway is alway a fun to drive, early morning on a Sunday, it was not very crowded either. I was concerned with traffic that I may encounter in Mumbai partly because of a political rally in the city, with help from HV Kumar group, I found a quick exit form Mumbai. The map above incorporates that. 9:35 AM Stopped for a quick tea break at Vithal Kamath. 9:58 AM Started back for onward journey. 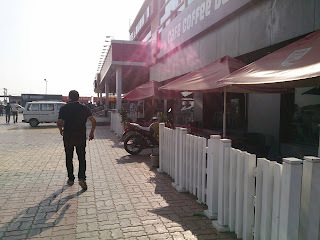 2:36 PM Just before Karjan, there is a rest stop which has Cafe Coffee Day, Subway and Dominos. We stopped here. The restaurants and other facilities (toilets) are good. As soon as I entered ring road, I was flagged off by a traffic police man, he stopped me, asked for car registration, pollution certificate and license. Also asked me, where I was going, to which I replied that I am going to Mount Abu. Then he walked to the front of car, possibly looking for that yellow sticker, which I had put on my car based on all the feedback. Then he let me go. No harm done. That Rs. 20/- for the yellow tape was worth it, I guess. 9:17 PM Started climbing the Mount Abu climb. It is approximately 20 Kms. I would not classify as a very difficult hill climb but it was dark and it was a hill climb after all. 10:00 PM Reached the hotel in Mount Abu. It was Cama Rajputana Club Resort. Here is my review of the hotel. This was the longest day of drive in this journey, we completed more than 850 Kms with a drive of around 14 Hours with a 2 hour break in between.